This section provides a variety of resources to help you get the most out of the application. 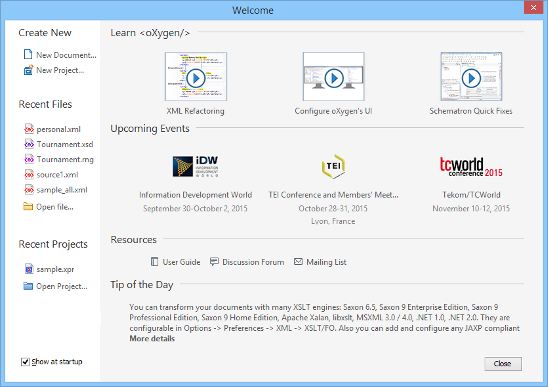 Typically, the first step of getting started with Oxygen XML Editor would be to install the software. For detailed information about that process, see the Installation chapter. After installation, when you launch Oxygen XML Editor for the first time, you are greeted with a Welcome dialog box. It presents upcoming events, useful video demonstrations, helpful resources, the tip of the day, and also gives you easy access to recently used files and projects and to create new ones. If you do not want it to be displayed every time you launch Oxygen XML Editor, deselect the Show at startup option in the bottom-left corner of the dialog box. To display it any time, go to Help > Welcome.